What’s the best way to purify water in freezing conditions? I’ve been spending a lot more time in freezing conditions lately than I have in the past. This has caused me to re-evaluate the way I purify water when its below freezing out. The problem you face when temperatures drop below freezing is the risk of your water purification system freezing and becoming ruined – as water within the system freezes it expands and damages the purification system. This is primarily a problem when you use filter based treatment methods. The other issue is that if all you have available to you is snow a filter won’t work. To get around the first issue, your filter freezing, I use either a SteriPEN or purification tablets. But what if your water source is frozen snow or ice? Most people will melt snow using a stove then continue keeping it over the heat until it reaches boiling to make it drinkable. If I’m trying to rehydrate a freeze dried meal or a cup of coco I’ll do this too. If I’m trying to fill up my water bottle or blader I’ll use my stove to melt snow until it becomes liquid. Then, I’ll take it off the stove and use a SteriPEN or purification tablets to make it drinkable. The reason I do this is to save fuel. 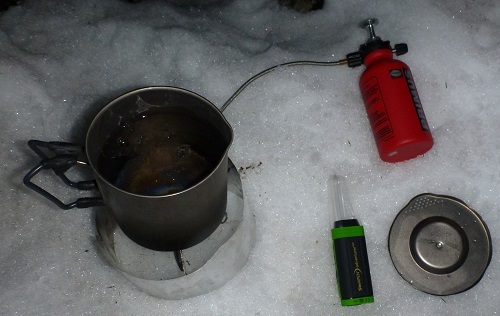 I’ve found the extra fuel needed to take water to boiling after you have melted snow is considerable. Unless you are only out for 1 or two nights the weight of a SteriPEN turns out to be much less than that of extra fuel. SteriPEN’s or tablets are also really convenient if you come across a stream. Its a pain to stop, take out your stove, and boil the water compared to the convenience of UV purification. Another method of conserving fuel during the melting process is to melt snow using either your body heat or the sun. If you are hiking for hours and have an extra way to store water (a Vapur Eclipse collapsible water bottle is perfect) you can fill it with snow and place it against your body under your jacket. This will actually serve double duty – keeping you from overheating and sweating during a difficult day of hiking as well as melting water to drink. If its a sunny day you can take that same water bottle and strap it to the outside of your pack. If its sunny enough you will have liquid water after an hour or two. In both these scenarios some method of treating water without filtering or boiling makes them far more convenient. This entry was posted in Activities, Alpine Mountineering, Articles, Activities, Backpacking, Gear, Camp Kitchen, Activities, Ski Mountaineering, Brands, Vapur, Gear, Camp Kitchen, Water Purification.